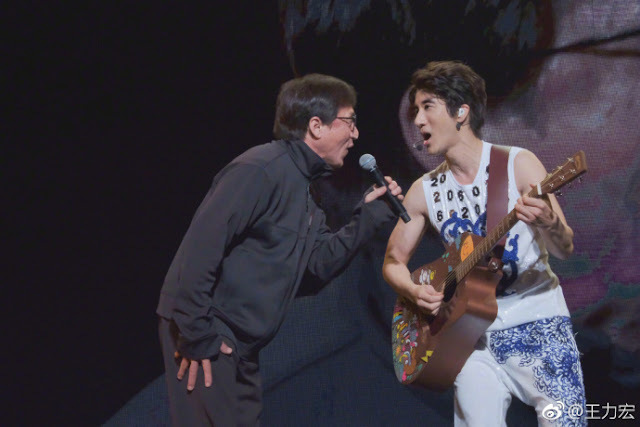 Wang Lee Hom recently launched his latest international tour, Descendants of the Dragon 2060, in China to promote his latest album, A.I Love. During his Shanghai leg of the concert last June 2nd, he had Jackie Chan as his surprise guest. Jackie was reportedly filming a movie nearby and took a break to present Wang Lee Hom with flowers where later on, they shared a kiss! (Gasp!) Jackie explained that Lee Hom was his greatest love so he just had to drop by. The only people who aren't surprised by this are probably the fans of the two stars. The two stars have gotten really close after filming together back in 2010 for Little Big Soldier. You might be surprise to know that wasn't the first time they did it. The first kiss they shared was back in 2011 during Channel V's 15th annual awards in Chengdu province. Wang Lee Hom was even quoted by popasia.net saying that it was his first time to kiss a man (Jackie Chan). The other photo of them was back in September 2012 during another Wang Lee Hom concert in Hong Kong. I think it's sweet and adorable that they are shameless in their unique expression of love for each other. I hope to see more of this in the future!